The other evening I had the pleasure of running into one of my favorite clients, Dr. Cesar Santos, at The Waterview in Rosslyn where he lives. The chance meeting was rather fortuitous as Dr. Santos had just purchased a stunning loft from us at Gaslight Square in nearby Courthouse and we were able to take care of a couple of final initials on the contract that I happened to have with me. We were done, congratulations!!! It was around 5pm and we decided to celebrate Cesar’s new purchase with a glass of wine up on The Waterview’s incredible panoramic roof deck. As a huge fan of DC, its history, architecture and culture, I relish every opportunity I can to appreciate it’s splendor and there is literally no better place to do so than from the 36th floor observation deck at the Waterview. We poured the wine and rode the private elevator up to the roof where we gazed out over the entire City, the Potomac River, every monument, every neighborhood and every important building. From there we had unobstructed views from Georgetown to West End, Kalorama, Penn Quarter and all the way to Capitol Hill and beyond. If it’s in DC you can definitely see it from the Waterview! The sun was beginning to set and the lights of the city began to sparkle like stars. It was truly stunning. I was surprised to learn that Dr. Santos is as big a “DC-file” as I am and we traded interesting “city facts” as the sun set and the lights came on all over the City. We stared out directly over the river at the glowing Kennedy Center, one of the places Dr. Santos volunteers and truly one of my favorite spots in the City. The Grand Foyer, one of the largest rooms in the world, is 630 feet long and 75 feet tall. The Washington Monument would fit inside with 75 feet to spare! 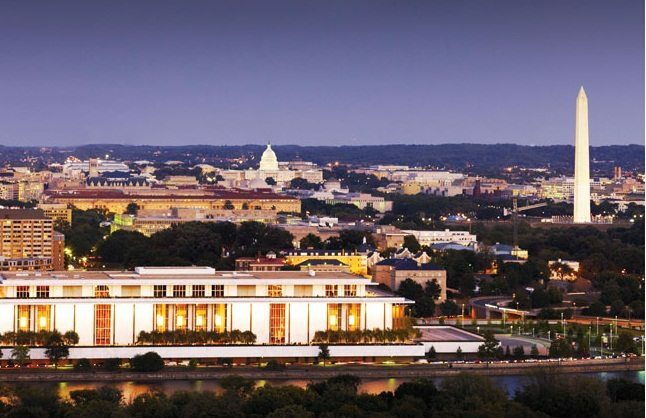 Over 8,000 people visit the Kennedy Center every day. All of the Carrara marble was donated by Italy. Tthe 16 massive Orrefors crystal chandeliers and matching sconces were a gift from Sweden and require a total of 8,000 lightbulbs. Each chandelier is 15 feet long, seven feet in diameter and weighs one ton. 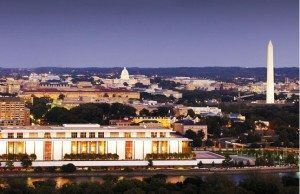 There’s a free concert every day at the Kennedy Center. The evening could not have been more beautiful and the company couldn’t have been better. I’m looking forward to many more evenings up on The Waterview’s roof deck and learning even more about our incredible city, the Paris of America!